Tuesday marked six months since two Sacramento police officers shot and killed 22-year-old Stephon Clark, an unarmed black man suspected of breaking car windows and a glass door on a neighbors house before the officers confronted him in his grandparent’s backyard. Clark’s family marked the half-year anniversary of his death by calling on police to take responsibility for the shooting. The family filed a legal claim earlier this month against the city seeking up to $35 million. Such claims are generally a precursor to a civil rights lawsuit. Clark’s mother Se'Quette Clark said she wants an apology from Sacramento police for killing her son. The Police Department never confirmed the identities of the officers who fired at Clark, but civil rights attorneys who identified them through file names on body camera footage the department released confirmed officers Terrence Mercadal and Jared Robinet fired the shots. 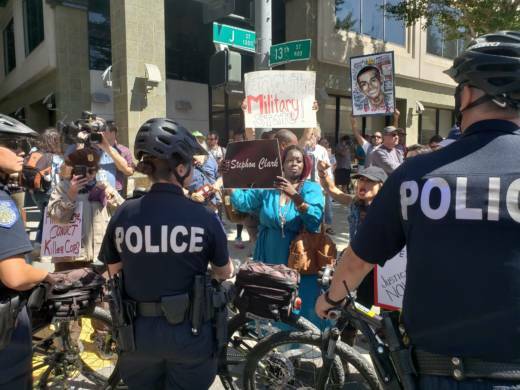 The family joined dozens of protesters who gathered Tuesday in front of a law enforcement convention in downtown Sacramento. Clark’s brother Stevante Clark said these past few months have been "hell." 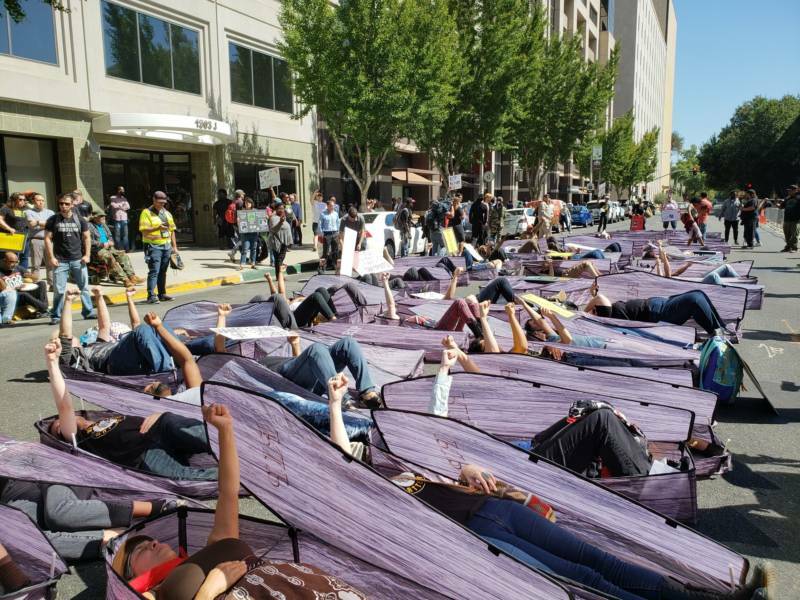 Protesters staged a "die-in," lying in nylon coffins in the street in front of the city’s convention center. Police, wearing helmets and visors, repeatedly warned protesters they could be arrested or injured if they didn't move. The protesters eventually began marching through downtown. The Rev. Al Sharpton will be in Sacramento Wednesday to call on law enforcement to expedite an internal investigation into Clark’s death. That investigation is ongoing, and no charges have been filed. The officers confronted Stephon Clark last March as they were searching for a burglary suspect. Video taken from a helicopter captured Clark in the backyard of a neighboring home, and the pilot reported that Clark broke a sliding glass door before he can be seen hopping a fence and walking into his grandparents property. The officers shout "gun" before firing. A cell phone was later recovered next to Clark's body. The officers fired at him 20 times. An independent autopsy commissioned by the family found Clark had been hit eight times and had been facing away from the officers when he was initially struck. The official coroner's report contradicted some of those findings.